Job growth in January blew past expectations, with some analysts attributing the increase to “animal spirits” – a term coined by John Maynard Keynes to describe the willingness of households and businesses to spend and invest. Employers added 227,000 net new payroll jobs in January, well above the 2016 average of 187,000 and beating Bloomberg’s survey of economists, which forecasted 180,000. 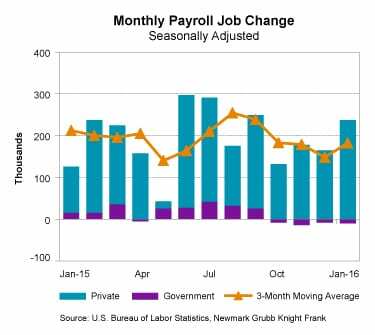 Revisions to November and December data subtracted 39,000 jobs. Sectors that added jobs last month included retail trade, adding 45,900; professional and business services, adding 39,000; construction, adding 36,000; finance, adding 32,000; and restaurants, adding 29,900. The surge in retail hiring, which seems at odds with post-holiday layoffs in department and clothing stores, may be related to seasonal adjustment factors. Health care added 18,300 jobs, trailing its six-month average. Manufacturing as well as the mining and logging sector added 5,000 and 4,000 jobs, respectively; manufacturers continued to struggle with exports, while employment in the mining and logging sector is stirring thanks to firming oil prices. The only two big sectors to shed jobs were government, losing 10,000 jobs, with most of the loss in education; and transportation and warehousing, losing 4,000. Wages increased by 0.1 percent last month and by 2.5 percent over the past 12 months, below recent trends. The unemployment rate ticked up a notch to 4.8 percent, pushed higher by a surge in the labor force of 584,000. This, in turn, pushed up the labor force participation rate by 0.2 percentage points to 62.9 percent. The U-6 rate, which includes labor market slack not picked up in the unemployment rate, increased from 9.2 percent to 9.4 percent. There were three key takeaways from the January employment report. First, the labor market may already be reacting to the business friendly policies proposed by the Trump administration – corporate tax cuts, infrastructure spending and regulatory relief – even though these policies are still in the formative stages and may not kick in until late this year or 2018. Small businesses, in particular, may be encouraged by the prospect of less red tape. Second, wages grew last month but at a slower pace than in previous months, suggesting that stronger inflation is not necessarily right around the corner. This provides some cover for the Federal Reserve to push interest rates higher at a measured pace. And third, analysts disagree about how much faster employment can grow given that unemployment is low and the labor market is near full employment. Nevertheless, there is room for “animal spirits” to have some impact on hiring and spending, which will support leasing activity in commercial properties and postpone the onset of the next recession. Which comes first, demand or supply? Economic supply-siders contend that a healthy business sector is the foundation for a healthy economy, making it easier for businesses to offer goods and services at low prices, and demand for their products will follow. Yet as important as businesses are in any capitalist economy, business capital spending accounted for 12.4 percent of the gross domestic product last year, whereas consumer spending accounted for 68.7 percent, based on data from the Bureau of Economic Analysis. Therefore, a robust consumer sector will create the demand necessary for a healthy business sector. Nevertheless, business capital expenditure plays a big role in the economy, specifically its impact on productivity, as companies invest in products and services to make their employees more efficient. Higher productivity growth delivers a higher standard of living, as businesses can pay their employees higher wages without triggering a spike in inflation. Labor productivity – the output of goods and services produced per hour of labor – has lagged in recent years, growing at an annualized rate of 1.1 percent in the current economic cycle, compared with 2.7 percent in the previous cycle from 2001 to 2007. Similarly, real (inflation-adjusted) business capital expenditure has grown by 1.6 percent in the current cycle, well below the 2.9 percent rate in the 2001-2007 period. Economists cite other causes of low productivity, including substandard schools and job training programs, and the inaccurate measurement of output in a technology-driven economy. • Consumer spending, which includes spending on goods and services, remains solid eight years into the expansion, rising by 2.7 percent in 2016 and by 2.5 percent at an annualized rate in the fourth quarter, according to the Bureau of Economic Analysis. Retail sales, a subset of consumer spending that excludes services, is up a healthy 5.6 percent from a year ago and 0.4 percent in January, as reported by the Census Bureau. • Corporate profits are showing signs of improvement. Profits fell in all four quarters of 2015 and again in the second-quarter 2016, according to Bureau of Economic Analysis data. Third-quarter profits increased by 5.8 percent, the strongest performance in more than two years. Although the Bureau of Economic Analysis has not yet reported fourth-quarter profits, FactSet, a private data provider that tracks the S&P 500, reported fourth quarter earnings rose 5 percent. • Several economic proposals of the Trump administration, if Congress goes along with them, would support business capital expenditure, including lower corporate taxes, provisions to encourage the repatriation of an estimated $2.6 trillion in offshore profits – an amount cited by Congress’s Joint Committee on Taxation – and an easing of business regulations. Political infighting in Washington could derail this process if it creates enough uncertainty among businesses and consumers. A hopeful sign is that Brexit, the departure of Britain from the European Union, so far has had little impact on the British economy. It may be that businesses and consumers across the globe are willing to look beyond moderate levels of political dysfunction so long as economies continue to grow. 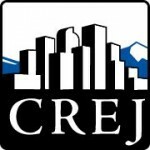 Featured in CREJ’s March Office Properties Quarterly.